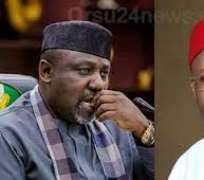 Four banks were, on Wednesday morning, sealed in Owerri, the Imo State capital, over their failure to respect an order of the court issued in favour of a former governor of the state, Ikedi Ohakim; and against the incumbent governor, Rochas Okorocha. The affected banks are Diamond on Item Street, First Bank PLC on Bank Road, United Bank for Africa on Mbari Street and Union Bank on Bank Road. When our correspondent visited the banks, staff and customers stood outside, as a red tape was used to seal the banks. A notice of attachment from National Industrial Court in Owerri, dated November 6, 2018, which was pasted in front of the banks, indicated that the affected banks had failed to honour a garnishee order issued by the court against the banks. A document of a court judgment on display at one of the banks on Mbari Street informed that judgment mandated the affected banks to pay the plaintiff his claims from Imo State Government accounts domiciled with the banks, which they had so far refused to do. The judgment was dated February 23, 2018. Our correspondent gathered that Ohakim had gone to court owing to the failure of his successor, Rochas Okorocha, to pay him his entitlements as a former governor of the state. The court delivered judgment in favour of Ohakim on May 24, 2016, but Okorocha allegedly refused to honour the court judgment. The ex-governor again went to court to enforce the judgment against the state governor by asking the court to issue an order for banks where Imo State Government accounts are domiciled to pay him. The court granted the request through a garnishee order on February 23, 2018, but the banks failed to pay the plaintiff. Ohakim went back to the court to get an order for the sealing off of the affected banks until the entitlements are paid. A bank staff who confirmed the development said, “Our branch has been sealed by the court.